The American Dream has long stood for a shot at upward mobility through hard work. But technological advancements, demographic shifts and an ever-changing economic landscape have altered the availability and the definition of work for future generations. Even as policymakers focus on creating jobs, many Americans today feel that the economy has left them behind. As more traditional jobs are consolidated by trade, technology and automation, many are rethinking work itself. What new training and retraining programs are available for those looking to overcome the skills gap? How will companies attract a diverse and inclusive workforce for the jobs of tomorrow? And what underlying factors are shaping our understanding of work? 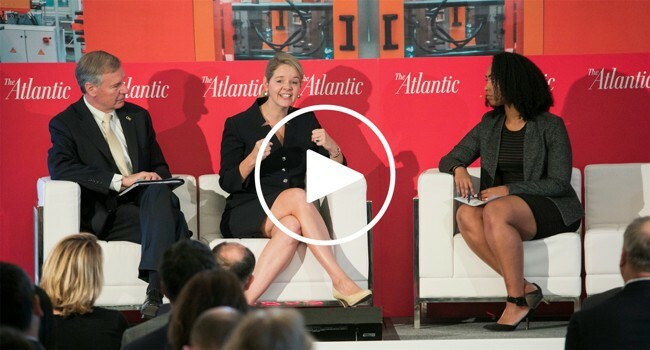 The Atlantic convened experts and heard from current workers to explore these questions at its second annual Future of Work Summit. Stephanie Klang, Professional Driver, Contract Freighters, Inc. The Atlantic explored strategies for America to fully address the opportunities and rising challenges we face in an era of increased automation and globalization.